The Super Eagles on Saturday thrashed Seychelles 3 – 0 at the Stade Linite to pick up their first points in the qualifying campaign for the 2019 African Cup of Nations. The goals came courtesy of Ahmed Musa, Chidozie Awaziem and Odion Ighalo. Musa and Awaziem handed the visitors a two-goal advantage in the first-half and Ighalo added the third from the spot after one of Kalu's numerous teasing runs was halted in the box. Gernot Rohr’s men were dominant from the blast of the whistle as the Nigerian side attacked from all corners of the field. It did not take long before the Super Eagles World Cup hero Ahmed Musa shot Nigeria into the lead with a powerful shot that hit the post and then the keeper before the ball went into the back of the net to make it 1-0 for Nigeria. 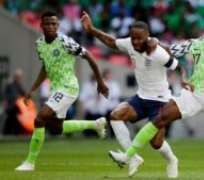 Chigozie doubled the advantage for Nigeria as Kelechi Iheanacho’s free kick hit the upright before the 21-year-old defender had an easy tap-in to make it 2-0. Nigeria’s third goal came in the second half after the Eagles best player of the match Samuel Kalu was fouled in the box. Kalu was making his debut for the Super Eagles produced thrilling performance to the delight of Nigerian football fans. It was the resulting spot-kick from the foul committed against him that was converted by Odion Igahlo to cement Nigeria’s performance.
. Rohr’s side will take on Liberia in an international friendly on Tuesday, September 11, in honour of the country’s newly-elected president George Weah.